Governor Branstand (L) and Ag Secretary Tom Vilsack. 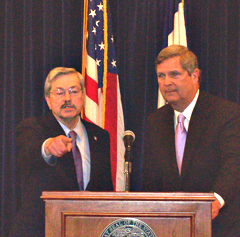 Iowa Governor Terry Branstad held a news conference yesterday with former Iowa Governor Tom Vilsack, the nation’s ag secretary, to denounce those critics. Find the audio of the news conference here. Beef Products Incorporated is the nation’s leading processor of this “boneless, lean beef” product. It has already shut down its plant in Waterloo, putting 200 people out of work. Branstad and a delegation of officials will visit BPI’s plant in South Sioux City, Nebraska, today which has reduced production dramatically due to declining consumer demand. BPI plants in Texas and Kansas have been idled this week and the governors of those two states will join Branstad today for a tour of the South Sioux City plant. National and local media have been invited to the event. Branstad accuses the national media of a “poisonous tone”about this product that will hurt the nation’s cattle producers and the people who work at the plants. The lean, finely-textured beef product is made from the trimmings left over after beef carcasses are cut into steaks and roasts. According to Vilsack, “hundreds” of schools asked the USDA to ban the product from school lunches. Grocery store chains, including Hy-Vee — the largest chain in Iowa, have moved to clear this product from their shelves, but Branstad says he’s convinced Hy-Vee to rethink that decision and the food chain will offer the product for sale, with a tag touting that it’s lean and less fatty.